Ok so a portion of the holiday is past. I didn’t watch what I ate as much as I should. And really, who does at this time of the year? So on Turkey day I ate the meat, had the stuffing, had the vegetable medley and or course a piece of cream cheese pie and two brownies. Lets not forget to count all of the snacks that came before dinner! So here I am back to my workouts today and cooking a better meal for my family and myself. I tend to get the “what are we having for dinner” question as soon as I get the kids from the bus stop. And as soon as they hear the word chicken, they both say “yuk”. Brooklyn can’t believe that we actually eat a chicken and I’m not sure why Caleb says it. I’m sure because his sister does. If Brooklyn knew that there was a portion of chicken in chicken McNuggets, I wonder if she’d eat them too! Today I’m using my trusty low fat cook book again. I made out my dinners for the week and came across one that we haven’t tried yet. And might I just say that if my family weren’t so picky I could make more from this cook book than just the chicken and desserts. Soups? That’s not for dinner. Sandwiches? Yuk, that’s for lunch. As we say in our family (as I’m sure many do), you get what you get and you don’t pitch a fit. Or you just choose not to eat and make yourself a bologna sandwich anyways! But because I feel much better feeding them and myself something that is good for us, I chose this meal over hearing their yuks. Which I’ll hear again once their plates are set before them!!! This one was simple to make and not much effort put forth. What more can you ask for! This leaves room for some of the banana squares afterwards! 1. Preheat oven to 400 degrees. Line a roasting pan with parchment paper (I didn’t have any so I sprayed the pan with Olive Oil spray) and set aside. 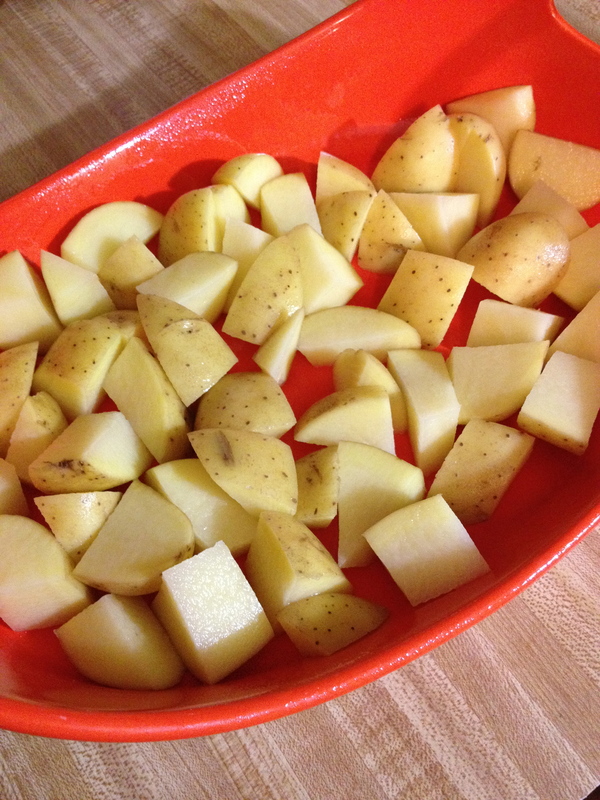 Scrub potatoes and cut in half (because I used the bigger potatoes, I had to cut mine smaller). Place in prepared pan. 2. 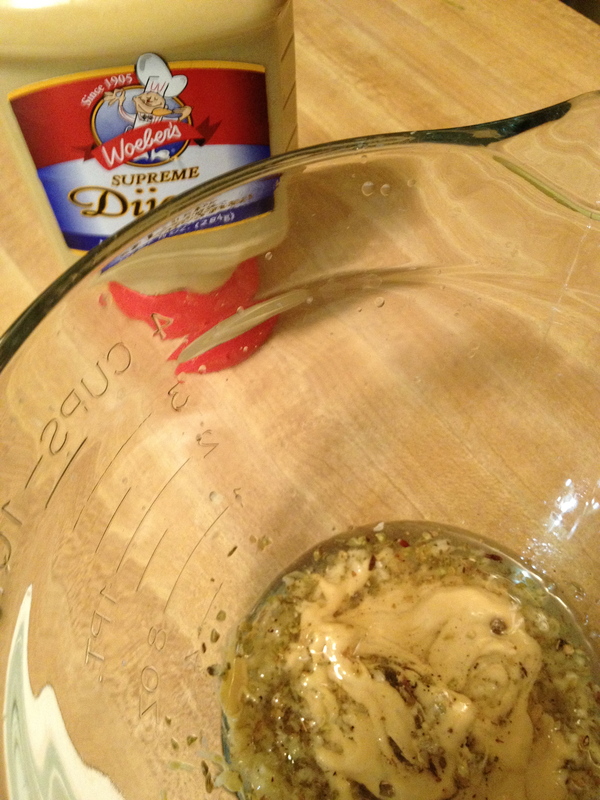 In a small bowl, combine oil, pepper, garlic, oregano and mustard and mix well. Drizzle half of this mixture over the potatoes and toss to coat. Roast for 20 minutes. 3. Cut chicken breasts into quarters. Remove pan from oven and add chicken to potato mixture. Using a spatula, mix potatoes and chicken together. Drizzle with remaining oil mixture. Return to oven and roast for 15 minutes longer. 4. If you MUST add the tomatoes you would add at this point. 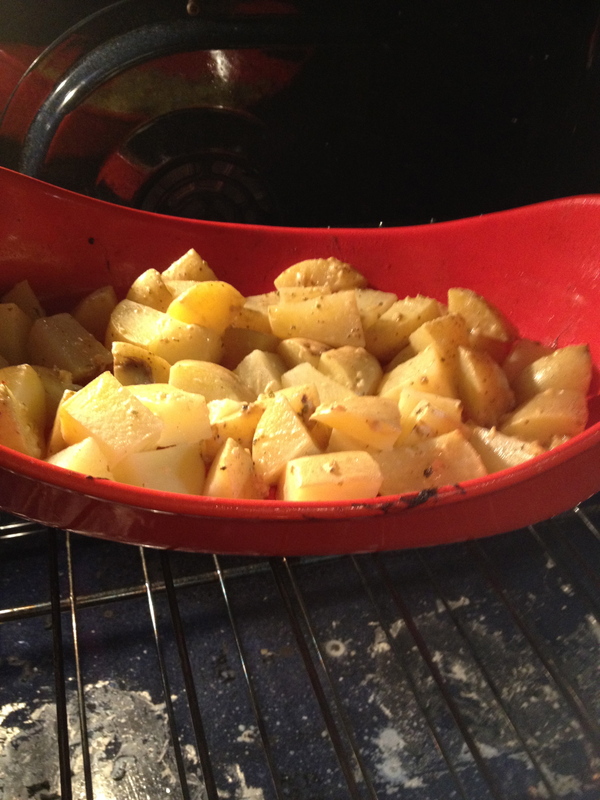 Roast them for 5-10 minutes longer or until potatoes are tender and browned and chicken is thoroughly cooked. <This from the cook book> This easy one-dish has the best combination of flavors. Mustard adds a nice bit of spice to tender chicken and crisp potatoes. A happy start to the beginning of the work week with a quick and easy meal! All kidding aside from the kids and the pickiness, this is a great dish and the mustard and the garlic really do add a great flavor. The kids put a bit of Ranch on top of theirs, so I followed suit. Great touch little ones.